Of the score or more field marshals created by Hitler three, and one grand-admiral, are still alive. Most of the others were killed in action, committed suicide, or were hanged by their captors. To have written a biography of Erhard Milch, least famous of the survivors, requires some explanation. When I visited them, most of his contemporaries were surprised to learn that he was still alive. In the last years of his life he closeted himself behind an anonymous front door in suburban Düsseldorf, looked after by a niece, writing reports for a foreign aviation company of international repute. I was intrigued by the man when I first met him. 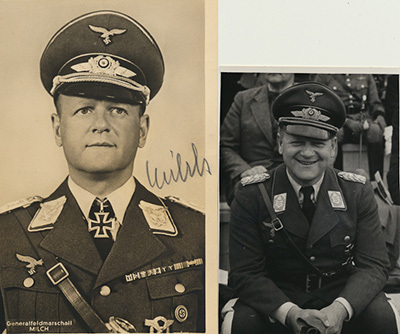 Erhard Milch, Hermann Göring’s deputy – his benefactor in time of poverty, his adversary in time of influence, his defender in time of trial – proved to be the repository of a thousand anecdotes of the war and its slow prelude. He was the senior of the surviving field marshals, and the highest-ranking of the surviving Luftwaffe officers. 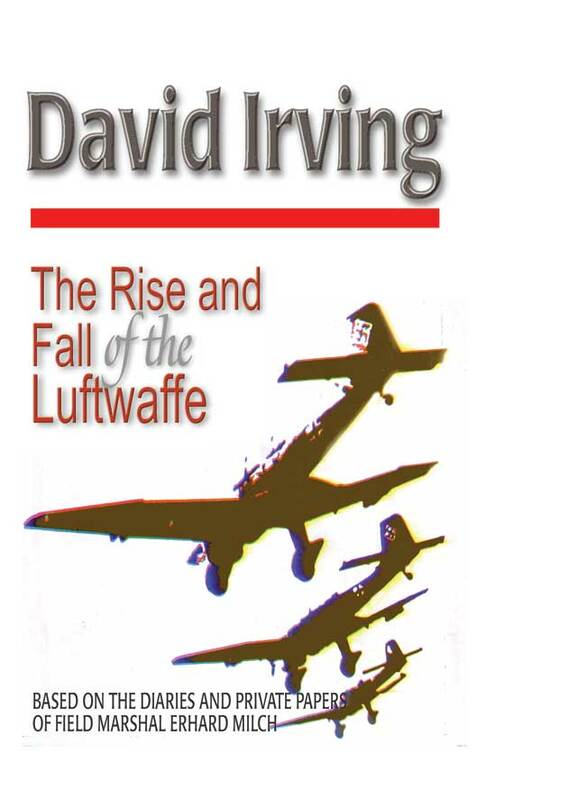 The Luftwaffe was a force which he, more than any other German, created. But more than that: the dapper, florid businessman sitting upright in the stiff armchair next to me, preparing to narrate the three score years and ten of his life so far, had already created for himself a niche in history, quite outside the world of politics, by the time Adolf Hitler first entered the Reich Chancery in 1933. It was Milch whose administrative cunning and personal dynamism fashioned the German Lufthansa airline from its beginnings in local companies into an international concern, while at the same time secretly providing and nourishing the industrial roots from which a future Luftwaffe would spring. This much is known. And yet the real story starts even earlier. During the First World War, Milch is to be seen with his hand camera, photographing Allied trenches from a German biplane; and if the wheel of time is allowed to spin, we catch a fleeting glimpse of the ex-Captain Milch, now commanding officer of a police air squadron in East Prussia, ordering a machine-gun to be turned on rioting strikers in Königsberg. He describes it as though it were yesterday. Then, supporting himself on a walking stick, for he has sciatica, he walks stiffly across the drawing-room to an antique cupboard and returns with a yellowing sheaf of documents – the reports he wrote and some newspapers from Königsberg, a city name long vanished from the map of Europe. When next I visited him I found he had retrieved from a local safe deposit a stained and heavy suitcase, which he unfastened to reveal some fifty diaries and notebooks. I leafed through one at random and found a young artillery officer trudging in streaming rain through the carnage of a midnight battlefield of the Russian front during the First World War. The language was simple, but written with great feeling for the suffering of the common soldier. It is clear that Milch was no Prussian officer archetype himself. His conversation was studded with scornful remarks about the Prussian generals whose obstinacy and lack of vision caused the Hitler Reich’s downfall, for he did not camouflage his enduring admiration of the Führer. He was a field marshal but never a true officer, if his First World War service be overlooked. From being managing director of Lufthansa he became managing director of the secret Luftwaffe. Only the rank and the uniform were new; the job was virtually the same. But it was the rank and uniform that antagonized his Prussian adversaries; and his competence infuriated them. The campaign they fought against him, with all the intrigues and tenacity the German general staff could muster, lasted the full eleven years from his appointment until his disgrace in 1944. 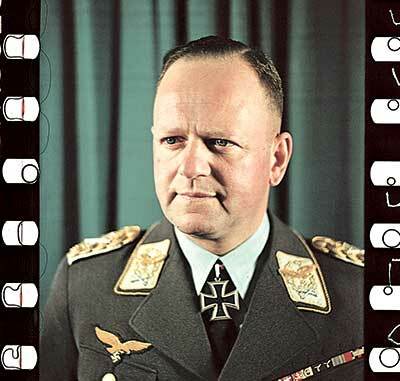 When this biography was published in West Germany the controversy was renewed, with able commanders like General Student hastening to the attack and others, equally able, coming to his defence. Milch ruefully quoted Friedrich Schiller’s lines on Wallenstein: ‘Torn by the hatred and favour of each faction, his name merges unsteadily with the past.’ (‘Von der Parteien Gunst und Hass verwirrt, schwankt sein Charakterbild in der Geschichte.’) Now that his personal papers and official records are open to inspection, we can reassess the role he played. The widow of another Luftwaffe field marshal, Wolfram von Richthofen, has written to me: "Now I have read the biography, I must say I am simply appalled at the intriguing and bickering that went on between the ministries, while every airman was doing his utmost at the front – and I myself lost a son as a combat pilot. The accomplishments that were Milch’s, and the opposition he had to overcome! I have wept bitter tears reading your biography – the tears of an impassioned soldier’s daughter, of a soldier’s wife, and of a soldier’s mother. I have been shaken to the core." My conversations with the field marshal for this book lasted four years. Subsequently he read and commented on the fifteen-hundred-page draft that I produced. The changes he suggested may interest the reader curious about Milch’s character. Once he invited me to delete Göring’s unflattering description of a minister at the time of the Röhm (“pale as a sicked-up pea”), on the grounds that the man is now dead. (He was hanged at Nuremberg.) 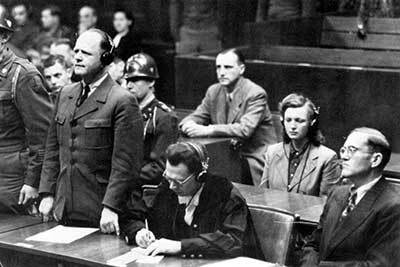 Again, a diary note where Göring disclosed a physical debility was removed at Milch’s request, with regard to the widow’s feelings. Nor was he devoid of sentiment himself: he was deeply upset when he read the chapter terminating in the suicide of Ernst Udet, his closest friend, and learned for the first time the hurtful anti-Semitic epitaph scrawled by Udet before he pulled the trigger. On occasions Milch argued powerfully for the moderation of critical passages founded on my reading of the primary sources of the time. Occasionally he told me a version of an episode he had clearly related so often that it had begun to live a separate, and often charming, existence of its own, almost wholly detached from the substance of what had really happened.